There’s nothing I love more than displaying words of encouragement and truth around our home. Learning how to make your own chalkboard sign for just a few dollars is a fantastic way of bringing character to your home without breaking the bank. If you’ve ever looked at purchasing the most beautiful chalkboards, you know that they come with a corresponding price tag as well. That’s why I am thrilled to share one of my favorite DIY hacks ever. 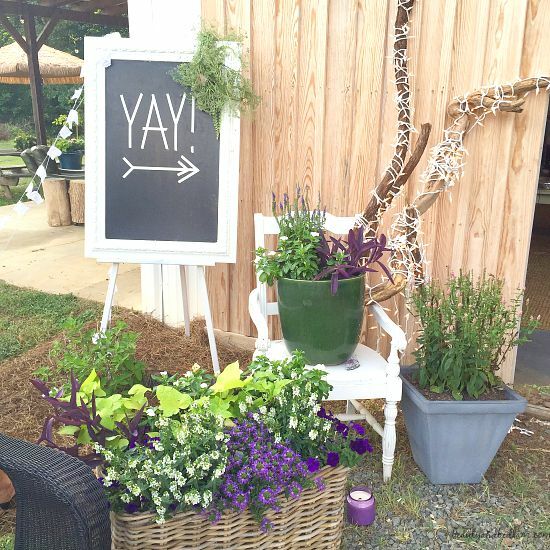 While I adored the DIY wood pallet signs that are so popular now and my tutorial shows just how easy they are to make, that project is for something more permanent. 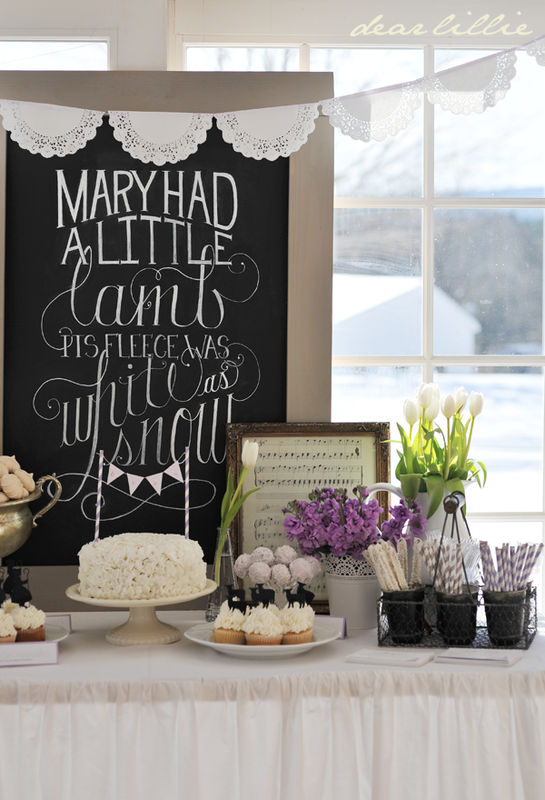 Chalkboard signs are so versatile because you can change them up seasonally and do all sorts of creative things with them. For years, the above picture from my blog friend, Courtney, has served as an inspiration piece for everything I love in a dining room. 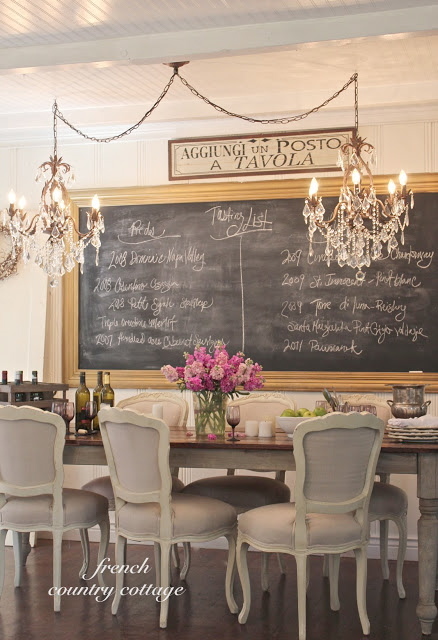 How she mixed the casual look of a chalkboard with a glam, yet cozy, dining room is perfection. 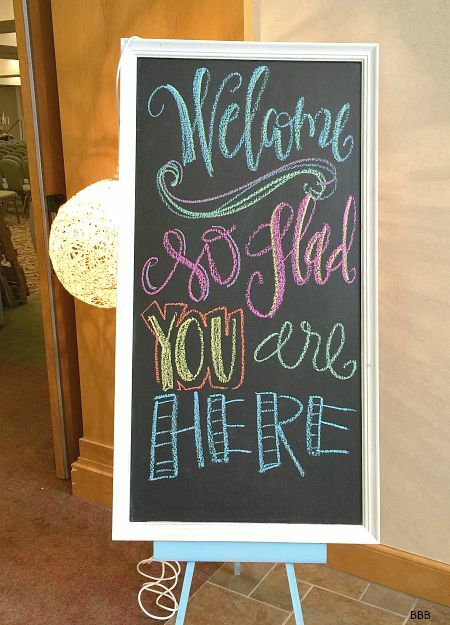 I’ve wanted to find a similar chalkboard, but I knew it would take some time to find one second hand. Well, guess what, my patience and perseverance paid off for only $7. Ok, ok. I know you are completely confused now because that doesn’t look anything like the above chalkboard, but that’s where you have to dream a little bit. While everyone else at Goodwill saw a poor picture that’s had a rough life, I saw all her dressed up potential and knew that it could be like Miss Congeniality all over again. Remember the movie, Miss Congeniality, where Sandra Bullock played the tom boy FBI agent turned beautiful Miss American contestant? I loved that movie. That’s how I feel about my picture. So much potential. 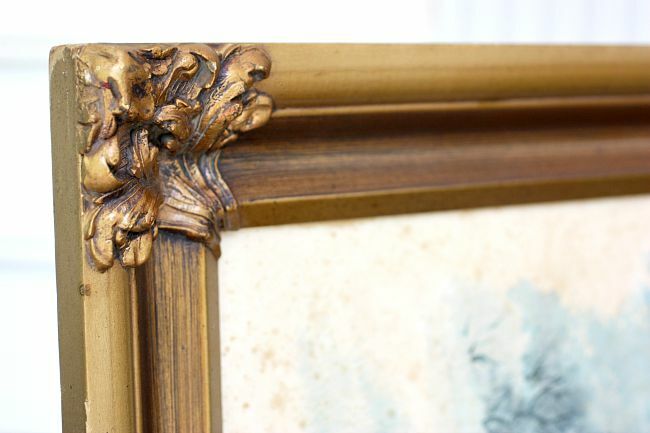 I bought her for the ornate frame, of course, and will be painting over the picture with some black chalk board paint to create the perfect surface. I haven’t decided if I should leave the frame gold or not, but when I gaze at the picture below, I’d be silly to change it. 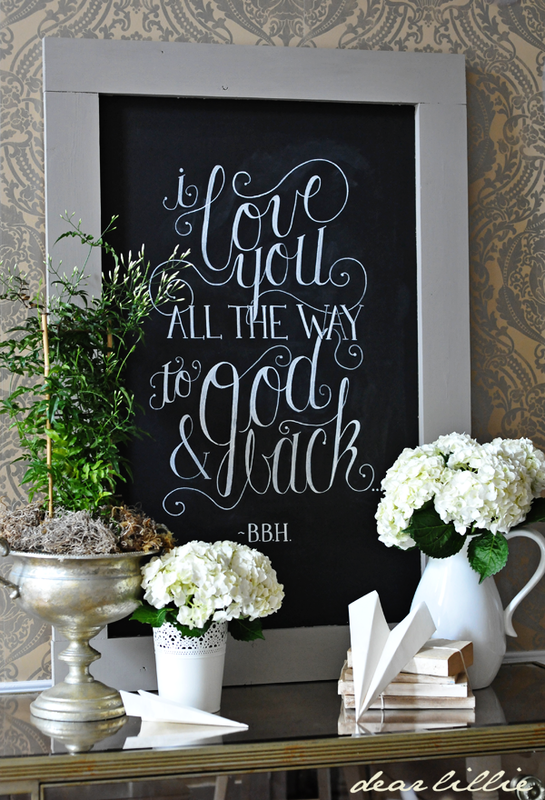 My friend, Miriam, who spoke a few years ago at my Becoming Conference, shared with HGTV how she made this ornate gold chalkboard sign. What a beautiful job she did here. And I loved that she used an existing framed mirror. And here is the large chalk board sign that I made a few years ago. She has such a different feel from the glamour ones above, but isn’t she so fun? Again, I found this at our local thrift store for around $7. All you need to do is keep on the look out for large pictures or specific frames that you’d like. 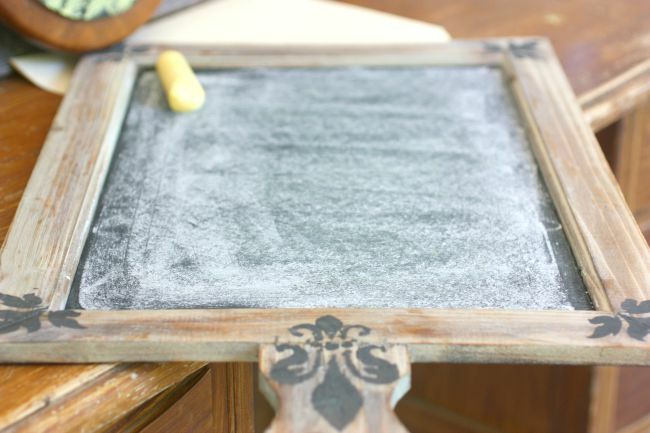 The process of making your own large chalkboard is incredibly easy. Paint over the picture with chalkboard paint and let dry completely. Apply an additional coat if needed and let dry. To prevent shadowing or ghosting of the letters (when you try and erase something and the outline of the word is left), it’s very important that you season or cure the board first. Use your chalk flat on it’s side and just rub it across the entire board. You want to make sure you do this thoroughly so that every nook and cranny has been covered. Then use a damp cloth and wipe all the chalk off. Dry and then repeat. It’s so easy and will help solve 95% of the ghosting problems that occur. 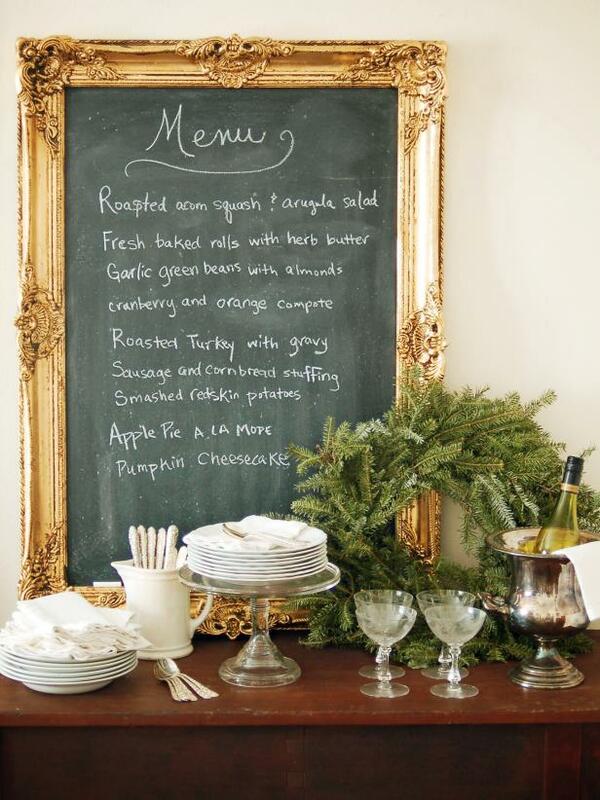 Don’t you just love how chalkboard are so versatile? I bet you didn’t think that. You can use them in a more glamorous atmosphere or in a fun and quirky way like the Nester did at her barn? I always love visiting her because she always changes things for our visits. If you are worried about perfect hand lettering, just use painter’s tape like she did. If you don’t want to hunt for an old picture and frame like I did, Dear Lillie shows you how to make your own rustic wood frame with only a screwdriver. Frequently she shares some beautiful printables too, so check here out. 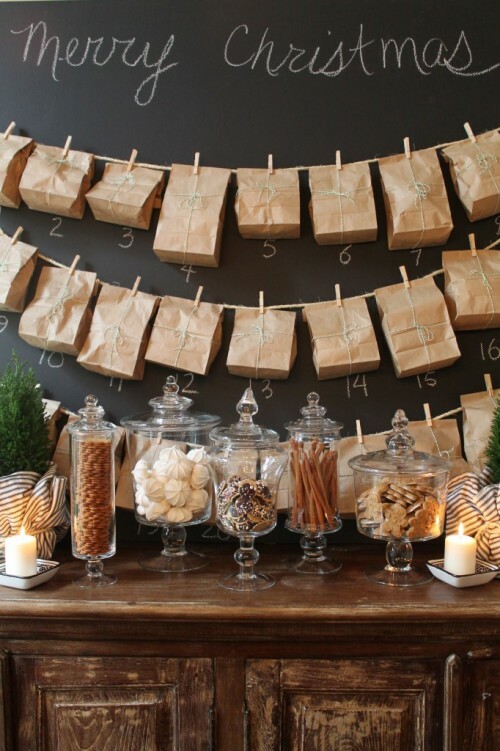 And finally, I love how this chalkboard has been used for the holidays to host their family’s Paper Bag Advent Calendar. It’s so creative and you know the kids could barely contain themselves waiting each day to open the bag. Phew – that’s a lot of inspiration and my desire is that I got your creative juices flowing. I hope you will fall in love with this fabulously frugal home decor idea as much as I have. 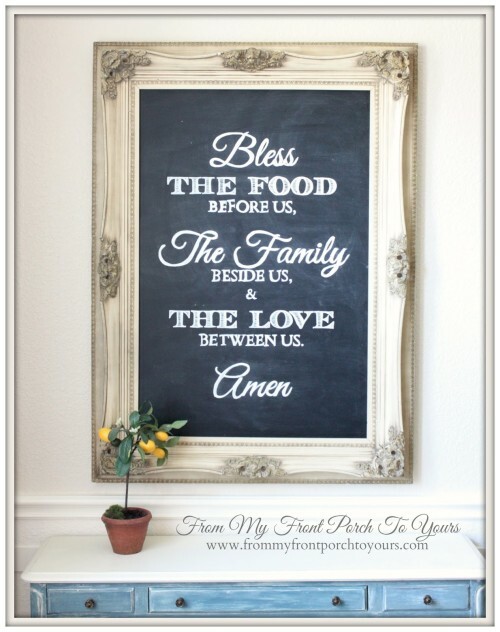 Making your own chalkboard sign is a wonderful way to bring character to a room without spending a fortune. I did a Periscope (live video) on how to make your own chalkboard sign and we chatted all things chalk board paint, so come watch the replay. (Again, it’s a little different then if you watched it live since the comments are not scrolling at the appropriate times, but you’ll get the idea.) If watching via email, you need to click over to blog to view. One of the questions asked on the periscope below was “What paint do I recommend?” There are many great brands and I’ve used many. 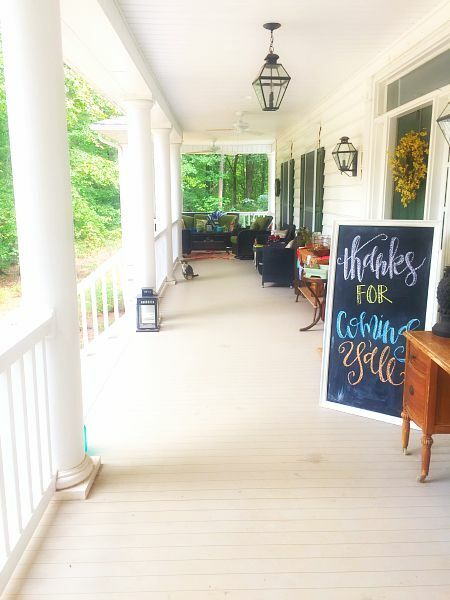 I always love Rust-Oleum Chalkboard paint (which comes in brush on or spray) and Decor Art Chalk board paint is also a brand I use regularly for all kinds of crafting. Personally, I haven’t used the spray chalkboard paint, but some of the commenters on my periscope shown below says they love it and for a huge surface, it would probably be much easier. I already had purchased some, so I used what I had because a little goes a long way. hee hee!! Oh, it was a good one. 😉 he still thinks it was the funniest thing ever and now wants to do that more often. I’m jumping on in a few minutes to do another one and am giving him a big warning. Very cute Jen! I’m on the hunt for a huge old picture with a fun frame for just this purpose! 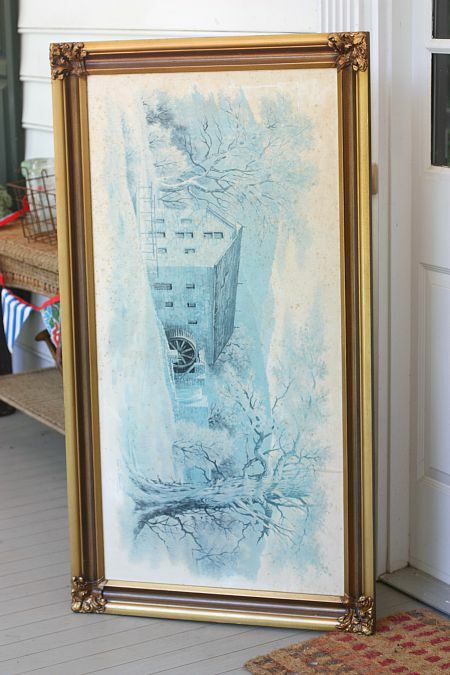 Our Goodwill has marked pictures waaaaaaaaaay up though – like $40 up! Whew! I have the perfect wall for a giant chalkboard … I guess I just have to be patient like you were! Like some of you viewers I LOVE the spray chalkboard paint – it is wonderful! So easy to use. 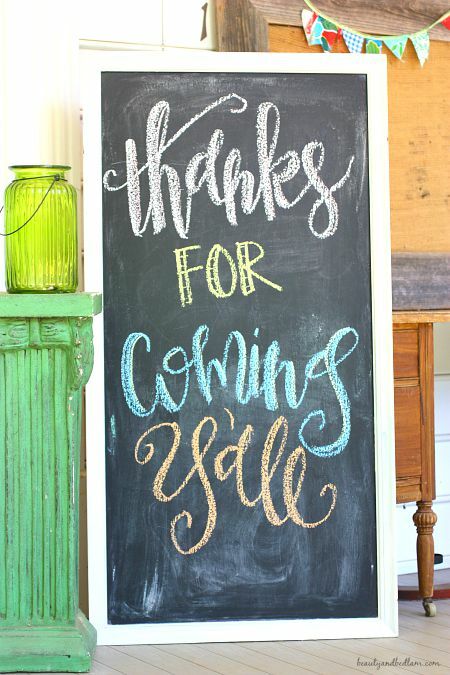 I wonder if you could use the canned chalkboard paint in a sprayer? Can you please post your finished chalkboard with the gold frame you got at Goodwill? Thank you! The colored dry erase ink wouldn’t work on a chalkboard with chalkboard paint because it would stain, but you can get different chalkboard paints at stores. They will mix varying colors, so while i don’t remember white, you could possibly find a lighter color and then use colored chalk.